Horowitz & Company’s QFT Analysis on Albemarle (ALB). 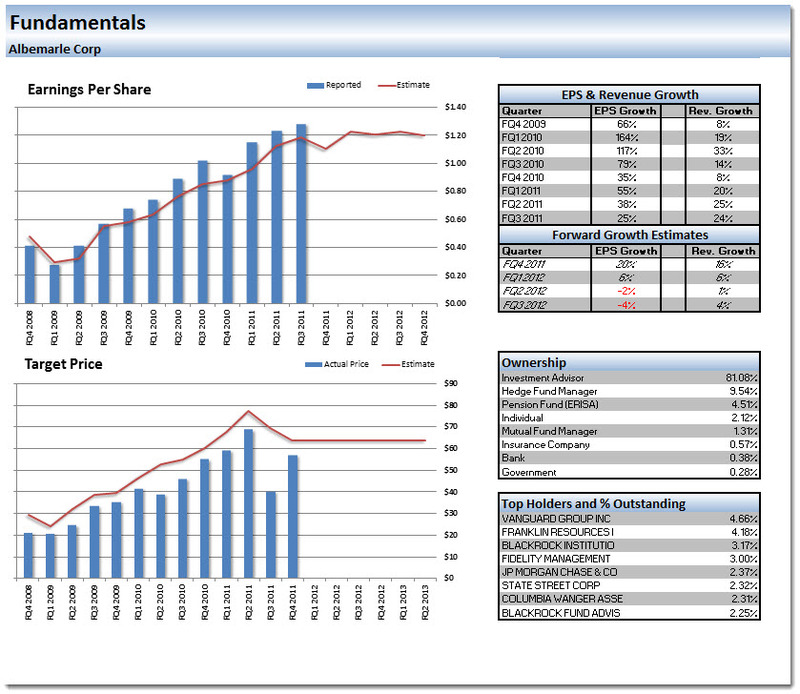 Albemarle (ALB) was upgraded today by Citi with a price target of $67. The stock is running higher on this and above to 200 day SMA. The one problem is that, while still early in the day, volume is not as “hot” as we would like to see with this breakout. “Horowitz & Company’s proprietary Technical Scoring System (T|score) takes into consideration both individual security technicals as well as the overall market direction when considering whether or not to purchase a company. H&C’s Market Trend Indicator (MTI) is a measure which is designed to evaluate the overall trend in the market. There are four designated levels to assess the trend which include: Strong Downtrend, Downtrend, Rally and Strong Rally. We are currently in an environment where the MTI is in a Strong Rally. All of our indicators are showing that the markets are in a strong rally and risk is back on. Investors of all risk tolerances may consider moving to a higher level of equities while still looking to pick up companies with increased levels of technicals. With that said, this stock ranks in the mid to below average percentile of stocks from an individual security technical score. H&C would not consider purchasing this position in any general market with the exception of a Strong Rally. H&C would be hard pressed to purchase this position even in a Strong Rally considering all other companies that may score higher technically in our growth model. 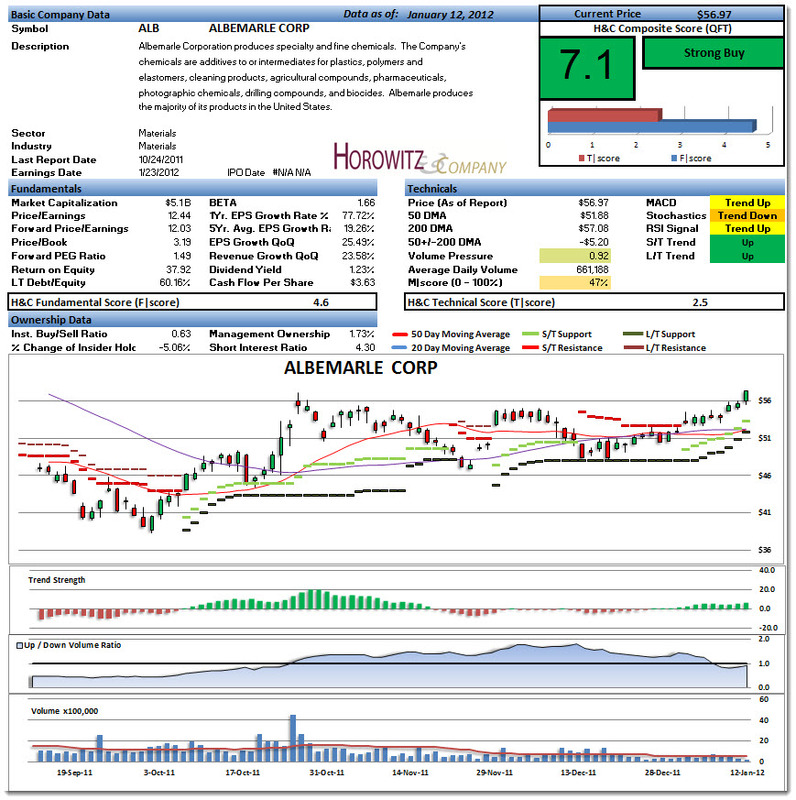 H&C currently sees Albemarle Corp (ALB) in a Short Term Uptrend and Long Term Uptrend. We find that EPS Growth on a Quarter over Quarter basis is one of the strongest components when screening for growth stocks. Continued EPS Growth in a company generally shows strength in leadership, the ability to manage expenses and improve the bottom line.Over the last three quarters, this company has done exceptionally well producing EPS Growth Rates last quarter, 2 quarters ago and 3 quarters ago 25.49%, 38.20%, 55.41% respectively. Revenue Growth similar to EPS Growth is also a strong component to consider when screening and scoring for growth companies. Continued growth in revenue shows that the company is innovative, marketable and its products remain relevant in the marketplace.Over the last three quarters, this company has done exceptionally well producing Revenue Growth Rates last quarter, 2 quarters ago and 3 quarters ago 23.58%, 25.25%, 20.04% respectively. Last quarter this company reported Earnings Per Share 8.2% better than analysts had expected. We believe this surprise although only for one quarter could set a trend for future earnings reports and guidance. Price relative to earnings growth is commonly referred to as the PEG Ratio. This company may contain added value as it’s PEG Ratio is 1.49. We generally would like to see the PEG ratio under 1.5 and it is even better if it is under 1.0.